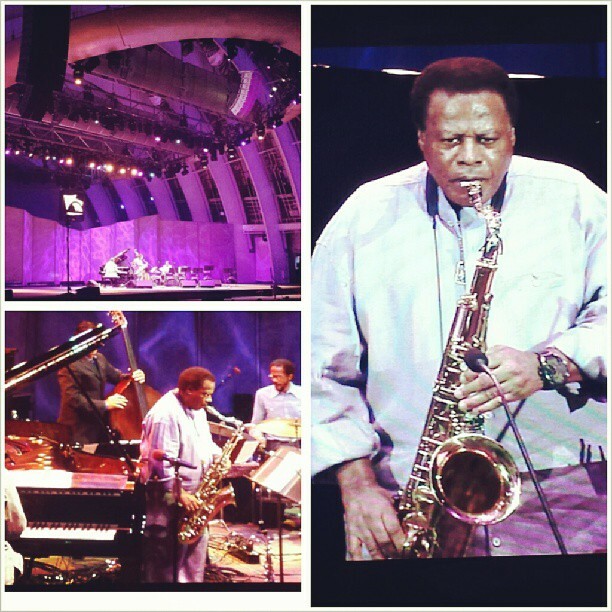 The 2013 jazz season at the Hollywood Bowl reached a peak Wednesday night with an 80th birthday celebration for saxophonist/composer Wayne Shorter. The participants featured, of course, Shorter himself, playing in duo with his close friend and creative associate Herbie Hancock, with his own quartet, and with the woodwind ensemble the Imani Winds. Other performers included the Joe Lovano and Dave Douglas Quintet and the trio A.C.S. (with pianist Geri Allen, drummer Terri Lyne Carrington and bassist Esperanza Spalding). Shorter himself did not actually arrive on stage, however, until the program was well underway. His connection with the opening act — the Lovano/Douglas quintet — seemed elusive, despite the fact that the band has reportedly been influenced by Shorter. In fact, the seemingly random improvising that was a prominent element in the Lovano/Douglas set often leaned more in the direction of the wide open free jazz ’60s style associated with Ornette Coleman. Although it was delivered with considerable skill, it often displayed more technical virtuosity than inventive imagination. 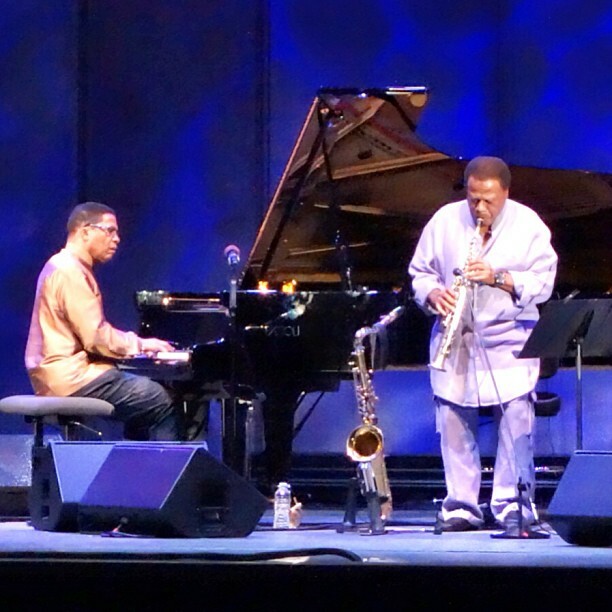 One of the evening’s creative highlights actually traced to the Hancock/Shorter duo, with Shorter playing soprano saxophone. Very much in the mold of the duet performances and recordings they explored two decades ago, the playing had the inventive flow of symbiotic improvising. Too bad more time wasn’t allocated for the always musically fascinating encounters between these two gifted players. The A.C.S trio took a somewhat more straight ahead jazz approach than the Lovano/Douglas group. But the improvising was no less ebullient, with Allen’s soaring piano lines underscored by the propulsive bass of Spalding and the irresistibly dynamic percussion of Carrington. Shorter had two more principal appearances after his duo segment with Hancock. Each had its own appeal. The first was illuminated by the highly engaging, compatible interaction between Shorter’s ever-adventurous playing and the spontaneous responses from the group he’s worked with frequently in recent years: pianist Danilo Perez, bassist John Patitucci and drummer Brian Blade. The second showcased another aspect of Shorter’s far-ranging creative skills via the selections he composed for the Imani Winds woodwind quintet. Here, too, the evening provided yet another perspective of Shorter’s iconic status as one of the most gifted members of his jazz generation. What was missing from Shorter’s 80th birthday celebration, however, was any on-stage acknowledgment of the event. Grant the fact that it was a pleasure to see and hear Shorter’s still potent musical artistry in action. But why couldn’t the production of the program also have included a host – possibly a celebrity host – with a thorough introduction of Shorter’s long career and superb accomplishments. And, too, there could have been something acknowledging the birthday and providing an opportunity for the more than 8,000 audience members to share the celebration. A singalong of “Happy Birthday” to Wayne? Why not? I’m guessing Shorter would have enjoyed it immensely, especially if the musical accompaniment had been led by Hancock’s always imaginative piano playing. Photos courtesy of the Hollywood Bowl.